Sports injury clinic Pain Physicians NY in Brooklyn, NYC is one of the first practices in New York to offer Platelet Rich Plasma (PRP) Injections for patients suffering with Knee Pain. We provide effective Anterior Cruciate Ligament injury treatment including advanced rehabilitation therapy and surgery if required. Our facility equipped with the most advanced, cutting edge equipment to treat pain. 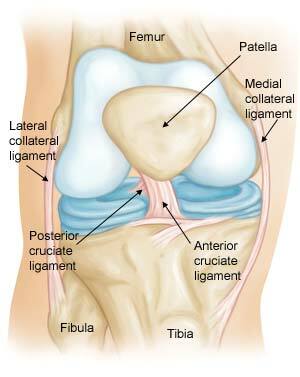 Unlike the collateral ligaments, LCL (lateral collateral ligament) and MCL (medial collateral ligament), which run on the outside of the knee, cruciate ligaments run inside of the knee. Their purpose, however, remains the same, providing support to the knee and making it stable. The anterior cruciate ligament, ACL, connects the bottom of the femur (thighbone) to the top of the tibia (shinbone). By connecting these two bones, it prevents the tibia from sliding out in front of the femur during the back and forth movements of the lower leg. Women are more likely to have Anterior Cruciate Ligament (ACL) injuries than men. Various studies on athlete men and women have shown that women tend to land from a jump in such a way that increases the stress on their knee joint, possibly leading to an Anterior Cruciate Ligament (ACL) injury. Anterior Cruciate Ligament (ACL) injuries are among the most common form of injuries in sport, accounting for about 40% of all injuries suffered. Unlike collateral ligament injuries which are often the result of a direct impact, cruciate ligament injuries, including Anterior Cruciate Ligament (ACL) injuries are often the result of low velocity, contactless deceleration injuries. Only contact injuries with a rotational component can be responsible for Anterior Cruciate Ligament (ACL) injuries. Some of these contactless actions that may lead to ACL injuries may include landing incorrectly from a jump or stopping and changing direction suddenly. These accidents can happen during sports such as basketball, football as well as any other physical activities. Nevertheless, when the symptoms are severe or extensive, symptoms will be evident on the outside. You should seek immediate medical help every time you get a knee injury as the knee joint is a complex structure made of bones, ligaments, and tendons that work together. By getting medical help on time, you will get the right diagnosis for your problem. Determining the severity of the injury will help you get the right treatment and get back to your normal daily activities as soon as possible. People who have an ACL injury tend to develop knee osteoarthritis more often than other people do. Knee joint osteoarthritis is a deterioration of the knee joint cartilages, the surface of which tends to get rough. Even though the ACL may be located deep within the knee joint, it can still be diagnosed through an assessment of the symptoms and by establishing the activity at the time of injury. The doctor will probably compare your injured knee to the other uninjured one and propose a series of motions. These help to identify the extent of the injury and guide the doctor on an appropriate treatment plan. If there is a reason to believe the damage is severe, further tests may be necessary using X-ray and MRI scans to determine the extent of the damage. X-rays are only used to establish if other components are damaged but MRI scans are better at creating images of soft tissues. As these injuries are so common, there are also a number of simple management methods, most of which don’t require any professional attention. Rest is the most important first step, to prevent further damage to the ligament, while compression with ice or brace help to reduce the inflammation. For pain management, over-the-counter pain relievers can be used to make the person comfortable, while more powerful corticosteroids may be prescribed to prevent infection. Rehabilitation plays an important part in the treatment of an ACL injury. A physical therapy will teach you exercises which you can perform even at home in order to stabilize the knee and to avoid extra pressure on your knee in the future. The goal of the rehabilitation is to strengthen your muscles and to restore the knee range of motion as well as to eliminate the pain and reduce the swelling. The ACL injury prevents you from doing your everyday activities, reducing your quality of life. The most advanced pain management center, Brooklyn pain management doctors and specialists at Pain Physicians NY offer unique, individualized approach to manage your Anterior Cruciate Ligament (ACL), knee pain injury. We are using the most effective pain management options including Platelet Rich Plasma (PRP) and Corticosteroid Injections and utilizing the latest technologies available in USA.